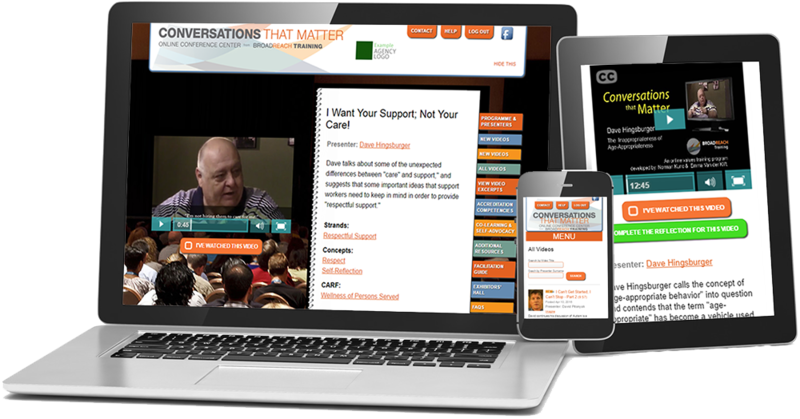 Conversations that Matter has more than 90 short (5 to 15 minutes) videos that can be viewed on a computer, a tablet, or an smartphone. We add 4 new videos every month. Each video has a series of behavior-based reflection questions; the answers can be emailed back to the agency. By using the videos and reflection questions in this way, an agency can merge values training, HR practices, and accreditation requirements into a mutually sustaining process. Directors, managers, and team leaders have the option of viewing reports of the videos that have been watched by various staff members. They can also view reports of staff members' answers to the reflection questions. Every video is linked to one or more competencies of the various accreditation standards. This provides agencies with an effective way to demonstrate that they have fulfilled accreditation standards. Shortlist job applicants by asking them to watch specific videos and then email their reflection answers to the agency. Easily enhance your orientation program by using the videos to foster self-reflection and discussion. Add specificity to performance reviews by asking staff to regularly view and respond to a prescribed number of videos. Staff teams can watch and discuss a short, engaging video at the beginning of every team meeting. This ensures the values of respectful support and authentic inclusion stay central in the discussions and practices of an agency. Use the videos to provoke new and innovative ideas about supporting people to make meaningful connections in the community. Viewing and discussing a video as part of a disciplinary meeting can transform a "Me against You" discussion into "Us Against the Problem." 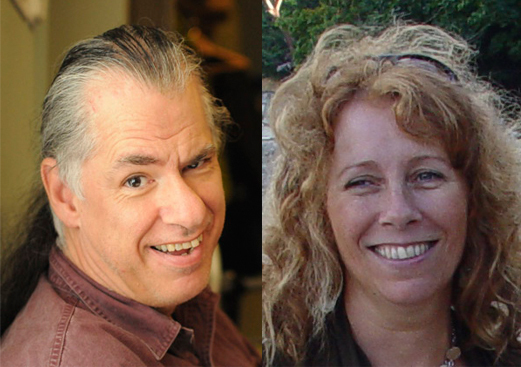 Although Norman Kunc and Emma Van der Klift are internationally recognized as dynamic speakers, trainers, authors, and disability rights advocates, they are perhaps best known for having written and produced the video, A Credo for Support. Born with cerebral palsy, norman initially attended a segregated school for disabled children. After successfully arguing his way into a regular school, Norman went on to complete an honours degree in Humanities and a Master's degree in Family Therapy. During his undergraduate years, Norman wrote a book about his experience in a regular school which catapulted him into a career as a speaker on disability issues. Emma initially worked in numerous positions with non-profit agencies that support individuals with intellectual disabilities. She has a Master’s degree in Conflict Analysis and Management and is certified both as a mediator and a negotiator. Emma has recently identified as autistic and is a prominent advocate in the neurodiversity movement. Norman and Emma developed Conversations That Matter because they recognized that enduring attitudinal change best occurs when people are engaged in ongoing dialogues about provocative and challenging issues. As a result, the goal of the Conversations That Matter site is not to inspire people, but to provoke self-reflection, deep-thinking and meaningful change. (Agencies must subscribe all of their staff. So to get around this perennial problem of values training, we set the subscription price as low as we could: $20/person per year. This price makes it feasible for the training to reach all of an agency’s staff. However, in return, we need agencies to sign up all of their staff. If we allowed agencies to sign up, for example, only their managers, we wouldn’t be able to financially sustain the site. Finally! Geographically remote agencies now have access to the high quality training that has only been available in urban centers. I can already see the positive impact that Conversations That Matter is having in our agency. Conversations That Matter has provided the employees and board members of CISS access to value based conversations which align and support the culture of our organization. At CISS we use CTM during; orientation, staff meetings, focused discussions, staff development and training. The impact on our organization is tremendous and has enabled us to be active and current in providing education to our staff. We chose Conversations That Matter over other training options because it speaks to our people in a way that resonates for them and inspires them to be better at what they do. We have a very decentralized workforce and we need to ensure that their daily approaches and decisions are guided by clear and aligned values. The videos are brief, focused and direct and that appeals to our teams. Conversation That Matter has allowed RSCL to extend training and learning opportunities to all of our staff. As it would be far too costly to send all our staff to traditional workshops, this format provides our staff with access to many the most well-known and respected teachers in the field for a fraction of the cost.